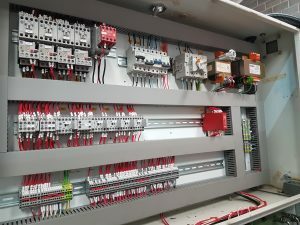 Replacement of existing electrical control gear panel, with new modern equivalent control gear. 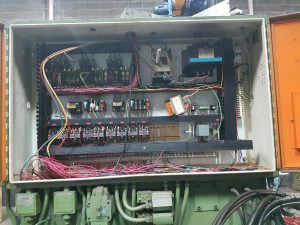 For this project, no electrical wiring diagrams/schematics were available for the machine. Each wire had to be manually traced and identified and new electrical wiring diagrams created to suit, using EPLAN Electric P8. 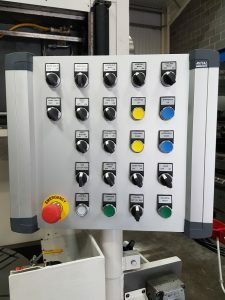 The project was seen through with Soag assisting in commissioning and running the machine, completed on time, within budget and to the customer’s complete satisfaction. The original operator’s panel was removed and a modern equivalent fitted, with new switch gear and replacement wiring loom. 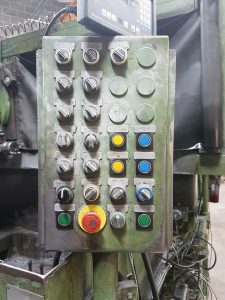 Soag produced a new back plate with new equivalent control gear and similar terminal layout to the original design, enabling the use of original machine cables. Before….